After years of planning and months of construction work, it took a matter of seconds for Abu Dhabi’s first cruise terminal building to be opened. This was a ceremony without ceremony, as His Highness Sheikh Hazza bin Zayed Al Nahyan strode from his official car to be greeted by members of the Executive Council – wearing gold bishts over their white kanduras – and then pulled aside the red velvet curtains over a white marble plaque marking the occasion. Not a word was uttered publicly as the prince then entered the terminal and went on board MSC Musica, which was making its maiden call to the port yesterday. Any of the ship’s passengers who witnessed the event as they left the ship to go on excursion, might have been understandably bemused at the low-key nature event, especially in view of the strict security that preceded it. Guards with sniffer dogs toured the ship before the Sheikh boarded for a 25-minute tour guided by Captain Francesco di Palma. The opening of the terminal building designed to accommodate up to three cruise ships simultaneously, marks the beginning of Abu Dhabi’s claim to grab a bigger slice of business from ships visiting the Arabian Gulf. For the first time, the capital of the UAE has facilities for embarking and disembarking passengers – 800 arrived yesterday to join MSC Musica. 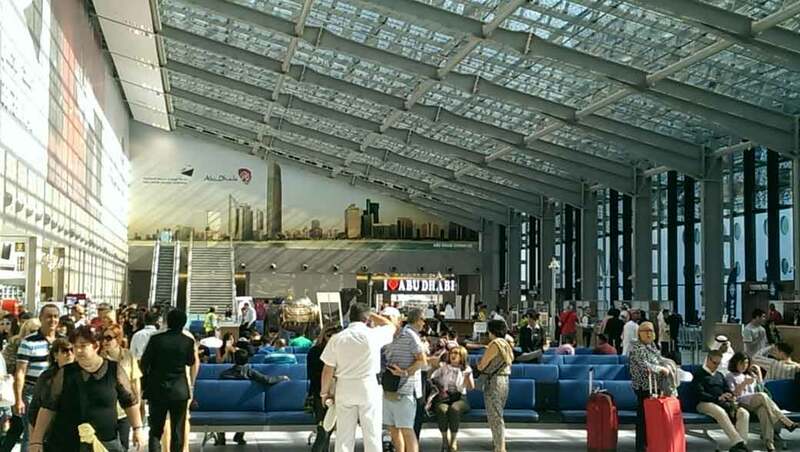 Passengers disembarking at the end of a cruise can check into their Etihad flights in the cruise terminal, and leave their luggage to be delivered to the plane. MSC Cruises is growing the number of visits and the number of guests rapidly. Last winter, MSC Orchestra made 11 calls during its 7-night cruises, and brought 32,400 passengers. This season, MSC Musica will make 18 calls and deliver 48,000. In winter 2016-17, the larger Fantasia will make another 18 calls, but with more than 63,000 passengers. 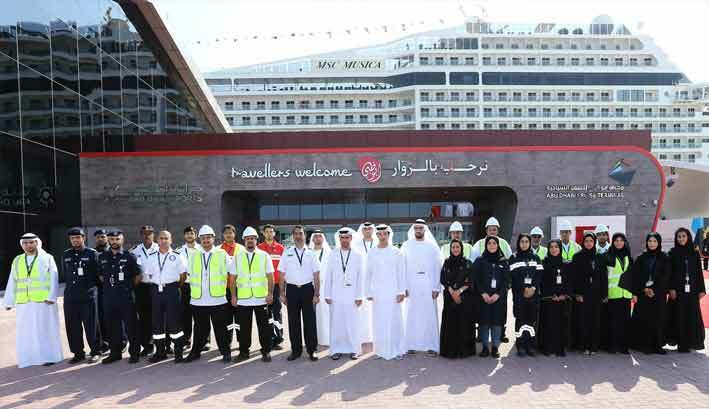 Zayed Port has 111 cruise calls scheduled during the 2015/16 season, expected to bring a total of 205,000 passengers – five times more than in 2006, the first year the port welcomed cruise ships. By 2019/20, the numbers are expected to have risen to 130 ships and more than 300,000 passengers.